In recent years, we have been required to deal urgently, and from a global perspective, with such issues as poverty reduction, transnational environmental issues, peace building and global public health. Among the various groups that tackle these issues, international civil servants have become more and more important in terms of their mission and responsibility. The Graduate School for International Development and Cooperation (IDEC) has been developing the capacities of individuals to solve problems in the international society since its establishment in 1994. In 2011, IDEC proudly launched a new education program, “A Special Education Program for Young Professionals Preparing for Careers in International Organizations (YPPCIO program)”, to support students who have career plans with international organizations. The objective of the YPPCIO program is to support and nurture students pursuing careers in international organizations. Specifically, the program is aimed at developing future leaders who can, with their practical experiences as well as technical skills and knowledge, play a major role in the field of international development and cooperation. In pursuit of these goals, the YPPCIO curriculum provides innovative knowledge and practical skills training to address emerging international issues. - Collaboration with peers from a wide range of specialties and areas of expertise. - Development of practical knowledge and skills necessary for working in the field of international development and cooperation, in addition to those gained from the regular curriculum of students' individual specializations. - Conferment of a certificate upon satisfying the requirements of the program. 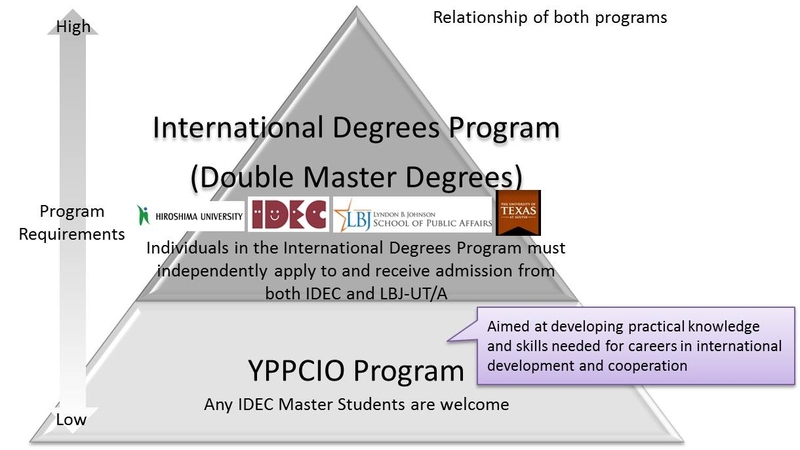 The YPPCIO program was originally offered as a sub-program under the International Degrees Program implemented in collaboration with the Lyndon B. Johnson School of Public Affairs, University of Texas at Austin (LBJ-UT/A) in the United States. Recently, by request from students, the YPPCIO program is now expanded and offered to all IDEC master's students interested in careers with international organizations. YPPCIO program still maintains a complementary relationship to the International Degrees Program as participation in both programs promotes greater effectiveness for attaining careers in international development and cooperation. YPPCIO students must take the following core courses: 1) Seminar on Practices for International Civil Servants I (2nd Semester, 2 credits) The course covers project cycle management as the basic tool for international civil servants. The objective is to acquire the background knowledge and skills for planning, implementing and assessing projects within the area of international development and cooperation, through case studies and student investigations. 2) Seminar on Practices for International Civil Servants II (1st Semester, 2 credits) The course focuses on building skills and experience in documentation and reporting through hands-on training and exercises. Specifically students learn how to compose the basic documents concerned, such as CVs, proposals for fund raising, and project reports. 3) Internship (2 credits) 4) Fieldwork (2 credits) IDEC recognizes credits from long-term internship and fieldwork in public policy completed in cooperation with local governments and NGOs. Students can gain competencies for solving various problems encountered on-site, as well as practical work experience, which is generally preferred and required for employment in international organizations. In addition, as extracurricular activities, students can participate in symposia and seminars related to their career development through invited lecturers and active professionals in the field of international development and cooperation. - Anyone, regardless of nationality, may apply for the program; but the applicant must be a master’s student of IDEC. Students who want to participate in the program is required to submit the registration form to IDEC office by the deadline. Students who receive certain types of scholarship may not be eligible, and as such it is strongly recommended that interested persons contact the program director for eligibility confirmation before applying. Successful applicants are selected by way of screening of the submitted application materials, including a short essay, and an oral examination. - A limited number of students are accepted.